Great signage getting to park. Managers were very welcoming and helpful. Good sized pull through spots. Quiet, clean, and well maintained park. Easy access to nearby attractions, stores, and restsurants. Would stay here again. Beautiful campground with great amenities. Staff friendly and helpful. Check in smooth and quick. They were actually waiting for me with a welcome message. Nice touch. Offered pull through which was helpful. Grounds were kept up and mainicured lots. Propane available and laundry quite nice. Lots were roomy enough and hook ups were convenient. Only negative is if you stay in the front lot, noise from road and local work lots is very loud. Could use a buffer of trees or something. Would definitely stay again. Very nice and clean, just a little road noise in front of park. But would stay again! Very nice and friendly people. We stayed one night while transiting the area in early March. The resort is close to the interstate and an industrial area so highway/truck noise is present but not overbearing. The facilities are very well kept and clean. The owners and staff are very friendly and will bend over backwards to help. The site we were on was a level gravel pull-through. They have propane on site which we took advantage of after staying at numerous state parks in cold weather. Would stay again if in the area. Nice park, great attitude and friendly check in, nice overall feel to the place. Only stayed one quick overnight. This is the second time we have stopped for an overnight between New Orleans and San Antonio. The managers have always been friendly and accommodating, the campground is well kept and they gave us a site that was easy in and easy out. It is also easy on/off I-10. We didn't use the restrooms. Easy on and out. Office was closed before we arrived. Staff called and explained procedures. Very easy. We enjoyed our one night stay here as we were traveling cross country. We arrived after hours and they had our paperwork and everything we needed in order when we arrived. They knew we were just passing through and gave us an easy access pull through site so we didn't need to disconnect our toad. The site was level and all hook ups were good. We would definitely stay here again. It's a very nice park convenient to I10. Our stay was quiet which enabled us to rest up and get back on the road early the next morning. Thanks. Very friendly people. We had a nice pull thru with full hookups. The owner gave us maps and directions to places we wanted to go and she even called to make sure they were open. The hosts were friendly and informative. The site was a pull through, level with a picnic table. When we arrived at night, our reservation packet was readily available. The park was quiet and serene just like a piece of paradise. I only wish we could have stayed longer. Ver nice front office/host staff. site was nice and level. decent space between sites. good laundry facility. Nice lake, but no swimming (alligator country y'all) we stayed here overnight on our way to New Orleans. It was a great stop and we would stay again if we are in the area. Easy access, nice clean camp ground, cute cabins , awesome view of the bay . No real complaints other than the weather was awful. The staff at the campground were very pleasant and were always helpful when we needed them. Actually, we stayed a month and booked very late. They were extra helpful in getting us a site that we could stay on without having to move. That meant alot since the park filled up quite often when we were there. It rained often while we were there and the only thing is that the park never dried. I know the water has no place to go and the grass will be wet but the driveways and site parking was also always great big puddles. It was impossible to walk anywhere without boots on the entire time. The holes should be maintained so there is at least dry pavement to walk on to and from the office, garbage, etc. Overall, the park was a nice place to stay. We chose this site based on the Good Sam's rating, and because it was on our way through Texas from New Orleans. The park was just purchased by new owners and the park managers were setting up the park software. We have a 33' fifth wheel and were given a site not far from the office. The front privacy fence was replaced with a nice white picket fence, but the back fence still had the old wooden slat fence. The roads are in need of repair. The patio was made of red brick tiles, which looked nice. Not many amenities. We consider this just an average park, but the new owners will hopefully upgrade it. We were disappointed with the town of Beaumont. Hardly any downtown or attractions. 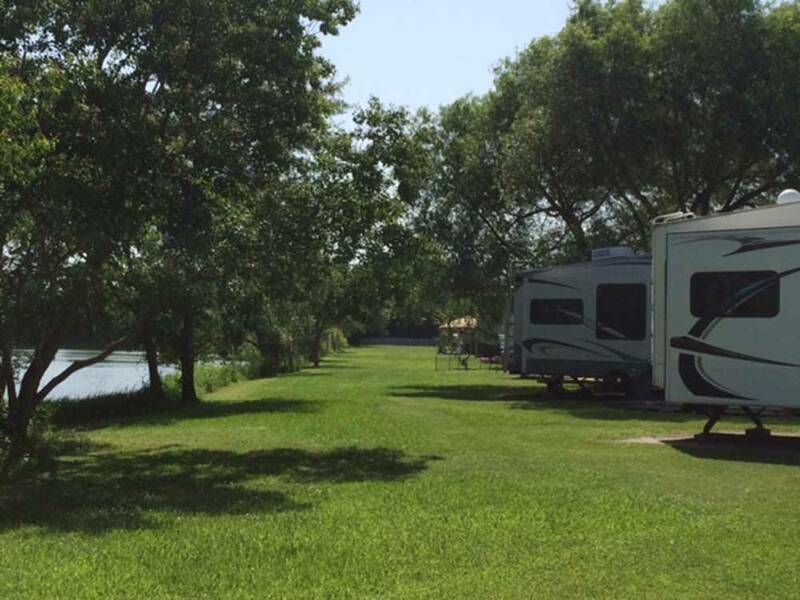 We are full timers and have traveled to 17 states and stayed in 30 different RV Park/Campgrounds in the past 24 months, so we have experienced all levels of facilities. Given the Good Sam rating for this park, we were very disappointed during our January stay in a pull-thru site. Certainly not a "resort" as there was no swimming pool, sauna, or play ground. Oh, there is a "lake" with one paddle boat, one canoe, and one kayak available for guests, but that's about the only additional amenity. Although the spaces are adequately spaced, the interior roads are "paved" but in horrible shape, full of potholes and uneven surfaces. Most campsites are uneven and collect large puddles of water after a rain. The pad at our campsite would be flooded with 2-4 inches of water after a moderately heavy rain and would not drain for 2-3 days. We had three of these flooded situations during our January stay. This park has some definite drainage issues. The management did not respond at all to my complaints about the standing water so I had to purchase a utility pump to pump the water off my site and into the roadway. Noise level at park is high as it is located next to a large truck repair center and about a eight mile from the constant noise of I-10. Also, the proximity of this park to the areas oil refineries resulted in frequent unpleasant odors. We did find the wifi and internet speed to be adequate for email and routine web access. We chose this park based upon the Good Sam rating and the park's web site, however, we will not stay here again. This small park is a little gem and a great spot to tour Beaumont. They have a nice walking area around a small lake. We had a back in site against the trees and it was very quiet. The office, laundry and restroom showers were wonderful and clean. Will stop again.